Read the happy stories of successful adoptions. There’s no question that the most rewarding part of our work here at the APA Adoption Center is bringing a cat or dog together with a caring family. It happens thousands of times a year, but sharing that moment of connection when the adoption is complete and the new companions leave our shelter together is always a thrill. Many happy adopters take the time to send us a note of thanks and an update on how the new family member is doing. We treasure these. And we’re proud to share a few with you. 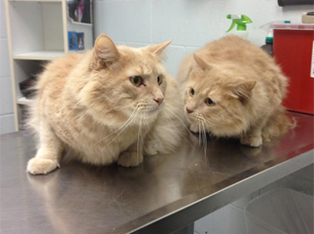 When Howard Stern and Oscar Wilde first came to the APA, we were worried about them because they refused to eat. We tried different foods and nothing worked. Finally, we tried one more thing- we put the brothers in the same enclosure. That changed everything! They immediately began grooming each other and went back to being healthy eaters. 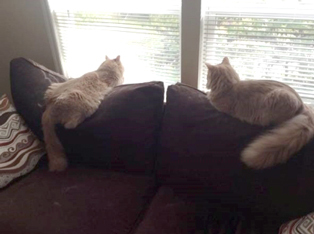 We knew that these two could not be separated again, so they would need an adopter who understood the importance of their bond. Thankfully, the White family came along and fell in love with both brothers. We’re pleased to report that the boys are doing just fine! Both seem to have enjoyed exploring their new surroundings and have quickly settled into some sort of loose routine. They become all excited when we get up in the morning and join us in the kitchen. After a while, they head upstairs to the family room and watch the critters for some time before moving on to playful activities. Both like that toy mouse that came in their gift bags! They also enjoy lots of pets, some belly rubs and an occasional hug. In the evenings, they join us in the family room to watch some television and, of course, play around and get more pets! We truly have enjoyed having these brothers in our home! Some of our pets have been waiting longer than others to find their forever homes. Could you be a match for a lonely heart? These clinics have generously donated a free office visit and wellness check for pets adopted from the APA Adoption Center.